In his first year of candidacy, Sonics star Jack Sikma was selected for induction into the Naismith Memorial Hall of Fame. Formal announcement is Saturday at the Final Four. 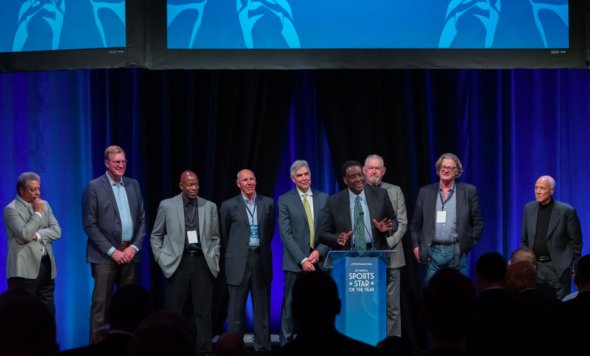 Sikma, 63, was one of 13 finalists under consideration by the Hall’s Honors Committee, a 24-person panel of basketball experts whose identities are not made public. Eighteen votes are required for enshrinement, which takes place Sept. 5-7 in Springfield. This was Sikma’s first year to be nominated, following a 14-year NBA career ended in 1991 with five seasons in Milwaukee. Other inductees with be announced Saturday. Other finalists include former NBA stars Chris Webber, Ben Wallace, Marques Johnson, Sidney Moncrief, Bobby Jones and Paul Westphal, former college coach Eddie Sutton, former college and pro coach Bill Fitch, former referee Hugh Evans, former women’s star Teresa Weatherspoon, and women’s coaches Barbara Stevens and Leta Andrews. Westphal played 36 games for the Sonics in 1980-81 and was Sonics coach from 1998-2001. Johnson was a color analyst on Sonics basketball broadcasts with Kevin Calabro in the late 1990s. A 6-11 center from tiny NAIA Illinois Wesleyan, Sikma was a first-round draft choice of the Sonics in 1977. The Sonics reached the NBA Finals in his rookie season, losing to the Washington Bullets in seven games. The teams had a Finals rematch next season, after new coach Lenny Wilkens shifted Sikma from power forward to center. The Sonics beat the Bullets in five games for Seattle’s first modern-era pro sports championship. The following year the Sonics reached the Western Conference finals for a third consecutive season, but lost to the Los Angeles Lakers in the rookie season of Magic Johnson. Sikma was traded to the Bucks following the 1986 season. Sikma averaged 15.6 and 9.8 rebounds in 14 NBA seasons. He played in seven All-Star Games, all with the Sonics. Sikma was among the best shooting big men in NBA history, which included leading the league in free throw shooting (92.2 percent) in 1987-88, the only center to accomplish the feat. He also led the NBA in defensive rebounds in 1981-82 and 1983-84. Sikma began his coaching career as a Sonics assistant from 2003 to 2007. He moved onto to the Houston Rockets for four seasons, where he tutored Yao Ming. When the Rockets’ head coach, Rick Adelman, moved to Minnesota in 2011, Sikma joined him until 2016. Since 2017, Sikma has been a coaching consultant in Toronto working with the big men of the Raptors, who are second in the Eastern Conference with a 56-23 record. Sikma and the Hall class of 2019 will be introduced at U.S. Bank Stadium before the first semifinal game in the Final Four. His step back shot was a big success during his career. He was always a serious banger on the boards. Congratulations Jack Sikma. I didn’t call it a step back. It was a reverse pivot that cleared the defender for a moment that gave Sikma a chance to put the ball behind his head for the catapult shot. For the life of me, I can’t understand why more players didn’t adopt it. To this day it still looked like he was shuffling his pivot foot…but you’re right, it was untouchable…. The only guy who blocked it was Mychal Thompson, who was quick enough to get around Jack and block it from the side. That’s great news about Sikma. But I have to ask, why is 2019 his first year of eligibility, nearly 30 years after he retired? It’s a different system. The minimum wait is just three years, but it’s entirely up to the individual, his teammates and friends to petition the hall for consideration. There’s no automatic consideration. Sikma’s friends created the modest campaign, and it worked. I imagine having the Sonics not around to sponsor him hurt his being inducted earlier. Lenny Wilkens, Wally Walker and Rick Welts probably played some big roles in making this happen. That’s what happened. See my Saturday column. Can’t say enough on how much I wanted to see this happen and considered petitioning the NBA myself for Jack’s sake for a time. I’m just too ticked off at the League for personal reasons that I know I’d get sidetracked and start to rant about another issue altogether. If Jack went to college today I doubt he’d have gone to Illinois Wesleyan and even if he did he’d have have been a top three pick. Can you picture if he played at UCLA or North Carolina? His play was too good and it’s amazing he fell to the Sonics at the seventh pick. He’s one of the few Seattle athletes who fans forgive for requesting a trade. I’d like to think he’d be the coach of the Sonics by now. If only. I’m looking forward to hearing his speech at his induction ceremony. I’m hoping Detlef Schrempf is next among former Sonics. IMO his play in college and internationally as well as his NBA tenure can get him in. Outside shot at Sam Perkins and Rashard Lewis. I wish Gus Williams and Fred Brown could but they most likely just fall short for consideration. Gus probably hurt his chances with his holdout and the Sonics not being around. But during his era he was a rare point guard who was more offense than a playmaker but didn’t hurt his team by doing so. A credit to the kind of team the Sonics had at the time. The NBA has nothing to do with the hall’s selection process. It’s an independent enterprise, as are the halls in baseball and football. Jack was an assistant coach in Seattle for a few years. Yet to get a top job. I’ll never forget when DJ left the team for Phoenix, for Westpha as I recall. That was the end for a fine team and I could never understand why that happened. Sikma was as steady a player as one could imagine and over many years. He was a great team player and I am happy another Sonic from that championship team has made the HOF (with DJ). The parade through downtown was until then the biggest ever in Seattle. The Sonics reached the NBA Finals in his rookie season, losing to the Washington Bullets in six games. C’mon, Art. I have your book. They infamously lost the 7th game at home. Yeah, but I had all the other words right. Of course I love the fact that Sikma is in, deservedly so. Hopefully Westphal, Freddy and Gus follow. They should be in someday. BUT I want to say how cool it would be in my mind if Marques got in. He and Calabro were a superb broadcasting team. Marques was the perfect compliment with his first hand knowledge of the game and he had his own style as well working with Kevin. Marques was a great player of course in Milwaukee and at UCLA but I truly miss Marques and Calabro as a broadcasting team. The teams had a Finals rematch next season, after new coach Lenny Wilkens shifted Sikma from power forward to center. If I recall, that decision was aided by the injury to Tom LaGarde and the emergence of Lonnie Shelton. With Dennis Awtrey and the immortal Paul Silas contributing big minutes when needed. Sikma was a natural 4. The fact he played most of his career at the 5 is a testament to just how good he was.